Motherwell slumped to a disappointing 3-2 friendly defeat at National League outfit Gateshead on Saturday at a sunkissed International Stadium. Yet the final scoreline could have been even worse for the Scottish Premiership side at the fifth tier English team as ‘Well trailed 3-0 heading into injury time before late goals by Ryan Bowman and Andy Rose added some respectability. The day had earlier started with an emotional minute’s applause in tribute to six-year-old cancer victim and Sunderland supporter Bradley Lowery. With four busloads of fans having made the 130-mile trip from Motherwell to watch their heroes, the Steelmen were looking to continue impressive pre-season form which had seen them record 2-0 victories at both Stirling Albion and Livingston. The most noteworthy incident of a dull opening period came when former Gateshead forward Ryan Bowman went down under a last man challenge by Gateshead defender James Bolton but referee Marc Edwards gave nothing when Bolton would surely have been red carded had it not been a friendly. 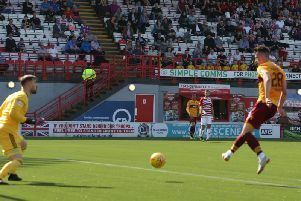 Motherwell right back Richard Tait headed wide in the 18th minute before the Steelmen produced a fine move which saw Craig Tanner’s shot saved after a Bowman pass. Tanner then gave the ball away at the other end before newly signed French defender Cedric Kipre – the Steelmen’s best player on the day – made a brilliant block from Macauley Langstaff’s resultant shot. Bolton’s cross was headed over by Jordan Preston as the hosts continued to attack, before the Tyneside team did hit the front when Langstaff shot home after a Hammell mistake. Gateshead put out almost an entirely new team in the second half but continued to push forward. And sub Kieran Green showed his quality by cutting inside from the right and firing a brilliant 20-yard strike past helpless Motherwell keeper Russell Griffiths. A fortunate third goal arrived when Tom White’s shot deflected off McHugh and flew past Griffiths. To be fair, Motherwell did then create several chances of their own with Bowman missing three and Carl McHugh shooting just wide. But the claret and amber side pulled back two late goals courtesy of Bowman’s header from a Frear cross and Rose’s close range effort.